Sound mangling becomes a mature and considered pursuit with this top-drawer audio damager. Typically great AD effects modules. Easy to use. Stunning presets. Innovative control method. Awesome value for money. GUI can be unresponsive. Preset switching can take a few seconds. If you're a MusicRadar regular, you'll be familiar with Audio Damage, the insanely prolific purveyor of unconventional but ingenious slicing and dicing plug-ins. And if not, we've just told you all you need to know. BigSeq2 takes the original BigSeq concept and powers it up to a whole new level. The plug-in has six different effects modules, which can be dragged into any processing order and each soloed or muted. One of the most interesting is Frequency Shifter, which, unlike a pitchshifter, shifts frequencies in a linear (rather than logarithmic) fashion, leaving an often metallic or discordant timbre. Filter offers a huge and intriguing range of high- and low-pass types, while Distort is your one-stop shop for fuzz and buzz - aided by a Warp parameter, which, like Frequency Shifter, creates odd but useful timbres. Delay does what it says on the tin, but in that funky and musical AD style that we've come to know and love, while Bits grinds your sample-rate and bit-depth into the ground. Finally, VCA offers control over the action of the gate sequencer, so it's pretty critical for determining the overall vibe of your sounds. To get your sounds moving, each module has its own modulation step sequencer, with up to 32 individual steps and timings ranging from quarter-note to 64th-note, including dotted and triplet values. A slider under the control knob of each parameter enables you to specify the degree of modulation (positive or negative) to be applied by its sequencer. To further excite matters, you can have the sequence move forwards, backwards or randomly through the steps. To counteract abrupt parameter changes, increasing the Smoothing slider will interpolate the steps. But what if you want to insert some choppy funk into the process? Well, each effect also has its own gate sequencer, which, like the mod sequencers, can be up to 32 steps in length, with its own timing. If one of the grid squares is shaded, the effect will be engaged for that step - if not, it's bypassed. This facilitates all sorts of chopping rhythms and rolling waves of effects. If you're stuck for inspiration or looking to get glitchy, clicking Rand in either section sets a random value for each of that sequencer's steps. And if evolving weirdness is more your bag, then engage the Reset mode and BigSeq2 will randomise the pattern every 1, 2, 3 or 4 bars, depending on your choice. As you may have twigged, the fact that each effect has an entirely independent set of Mod and Gate sequence settings is a big plus. You can easily set one element (filter cutoff, for example) rattling away randomly while another more blatant sound-mangling effects hold down a recognisable rhythm. 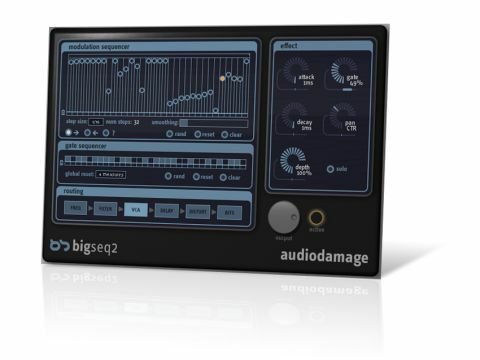 BigSeq2 is yet another winner from Audio Damage. We reckon the company's best efforts are those that do weird and wonderful things to your signals, and this certainly qualifies on that score. It's more flexible and manageable than some of the crazier AD effects, and consequently, it sounds more 'grown up'. Our only real niggle is that the GUI isn't the most responsive, being occasionally a bit slow to react (it can sometimes take a while to flick between presets, too), but we can put up with that for now, as BigSeq2 is easy to use and full of character, and comes with a stunning selection of presets. If you make any kind of electronic music at all, you unquestionably owe it to yourself to get hold of this little gem.